We are pleased to publish the latest revision of the Singapore Bird List to include taxonomic changes based on the latest IOC World Bird List version 7.3. The latest list in Excel format can be found HERE. In the early morning of 29 April 2017, 2 boats with 10 birders/bird photographers on board each set off from Marina Cove headed towards Horsburgh Lighthouse. The lead boat “Boon Teik” was followed closely by its sister boat “Popeye“. This is the second trip organised by See Toh Yew Wai with mainly contributors to the Singapore Bird Project. The first trip was documented previously in this blog here. Here is the summary of the bird count for both boats. As you can see, the count for both boats differ rather significantly due to the presence or absence of some star birds. This despite the fact that the boats were hardly 50 meters apart most of the time. As we have discovered previously, the scanning ability of the participants greatly affect the outcome of what was seen or missed. 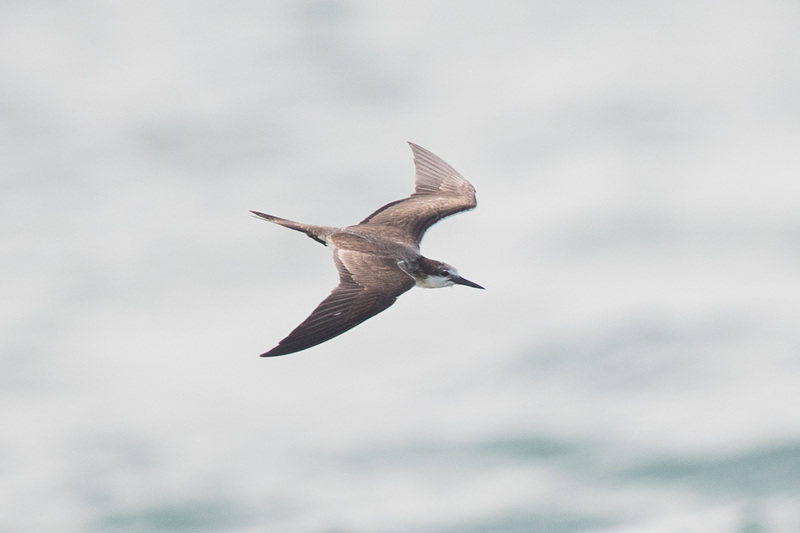 For instance the Long-tailed Jaegers were seen only on Popeye and the Parasitic Jaegers seen by both boats were reported at different location. Likewise the Bulwer’s Petrel was mainly noticed by the Boon Teik’s participants and only glanced through by most of the Popeye’s photographers. 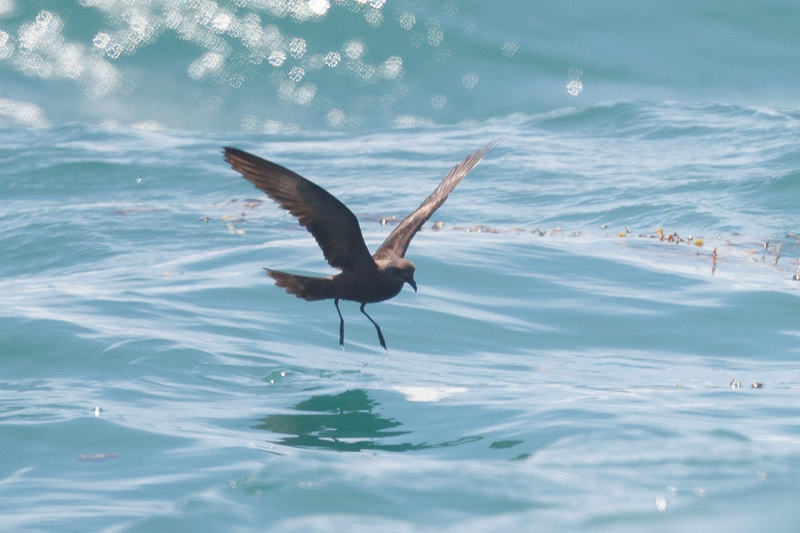 The star bird of the trip was of course the Bulwer’s Petrel, the second sighting of the season. 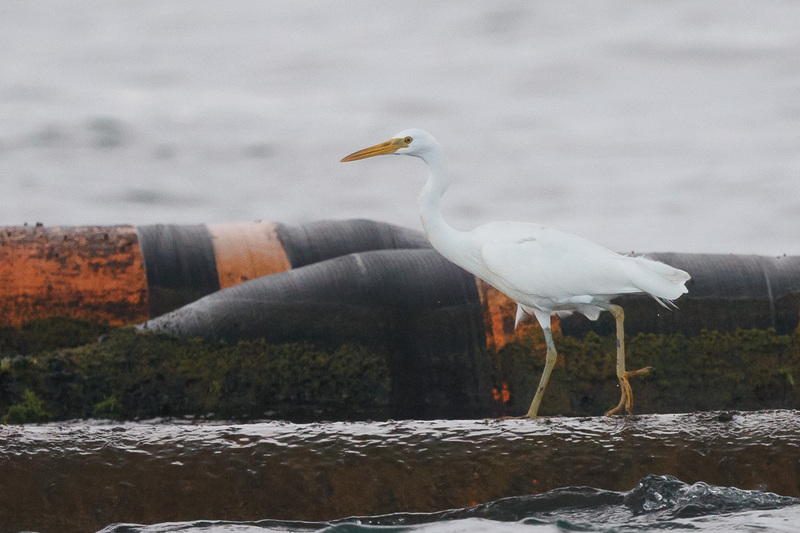 It is likely the same bird seen previously in November 2016. The Short-tailed Shearwater numbers were very encouraging too. A yet to be identified shearwater also proved to be exciting, but it was quite a distance away and the photos proved rather inconclusive to ID so far. The sightings of the Long-tailed Jaegers and Parasitic Jaegers were also of significance and they were in their breeding plumage with their tail projections seen. The biggest stars to most of the participants were not birds though. A small pod of 3 Indo-Pacific Humpbacked Dolphins swam around both the boats at Horsburgh Lighthouse delighting us all. We have made some additions as well as deletions to our checklist based on recent sightings or the lack of them. Jacobin Cuckoo which was sighted in December 2013 and on subsequent season in 2014, both at Lorong Halus Wetland. Black Hornbill with a subadult male sighting in July 2015 at Pulau Ubin, followed by ongoing sightings of a female also at Pulau Ubin. 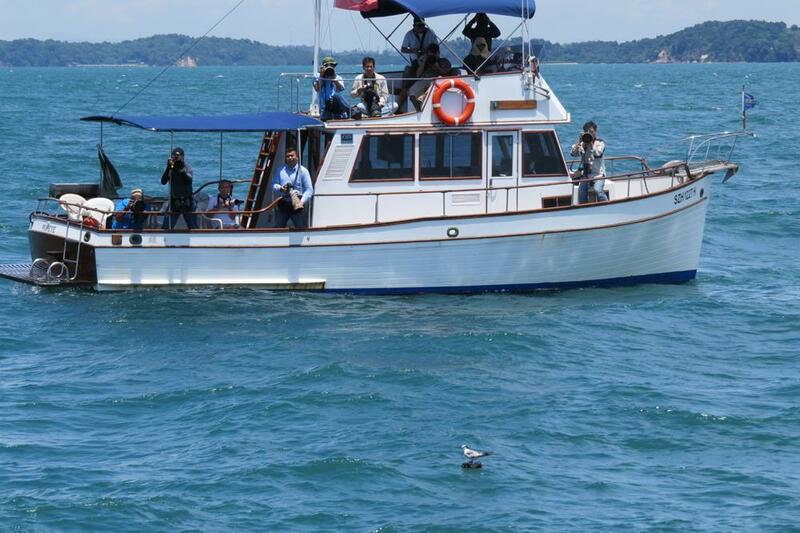 Bulwer’s Petrel sighting at Singapore Strait on a pelagic trip organized by photographers on 12 November 2016. All four were introduced species that went feral but subsequently extirpated. Our reasoning is that there is no possibility of re-introduction from neighbouring region since they are introduced species. Any new sighting will have to be new introduction/escapees. Eastern Barn Owl, Tyto javanica, formerly Western Barn Owl as the subspecies javanica in the Malay Peninsula is now clumped with their Australasian brethren. Pomarine Jaeger renamed from Pomarine Skua for consistency as their genetic relationship to Catharacta skuas requires confirmation. Lastly, thanks to the effort of Tou Jing Yi, the complete Malay name for all the bird species in the checklist is now included. The Chinese name for the birds have also been updated to reflect changes since the last revision. 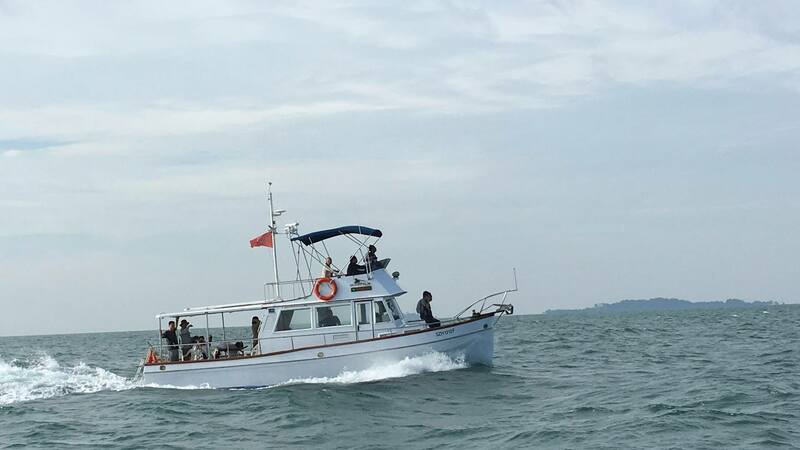 A few of the regular contributors of the Singapore Birds Project organized and gathered together for a pelagic bird survey trip to the Singapore Strait. 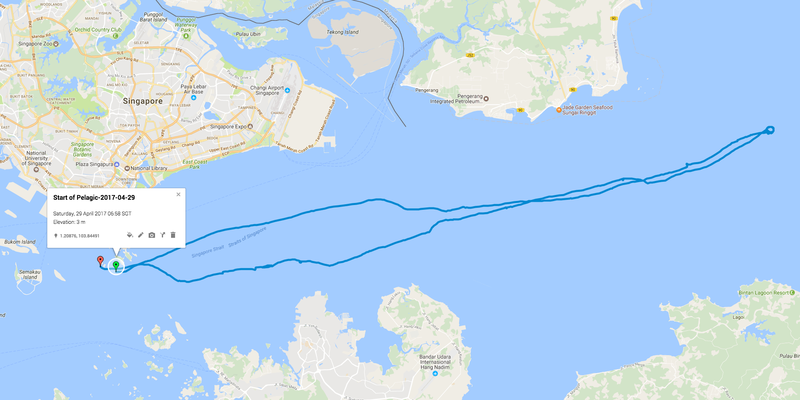 This time, we decided to head west of Sentosa (our starting point) towards the direction of Karimun Island and Kukup, Malaysia and heading back towards Singapore in a loop. 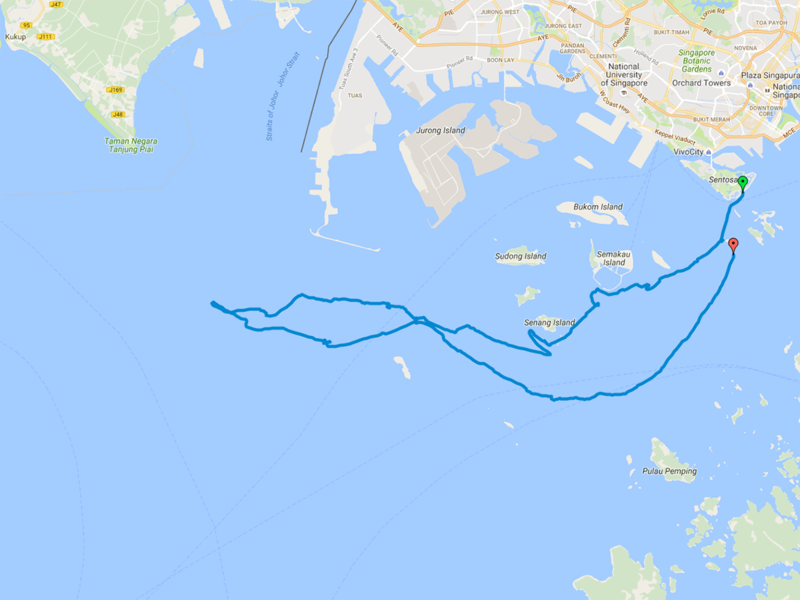 This part of the straits is sadly much less explored birding wise and we wanted to find out what sort of bird life exist there. The route taken for the survey. The green arrow is the starting point at Sentosa. We chartered two boats. “Boon Teik” the lead boat is our regular survey boat, while “Popeye” was a new boat by the same operator and was to follow the alongside the lead boat. The author was assigned to “Popeye” so all of the bird photographed and counted are taken from this boat. Due to some unfortunate delay, the lead boat was late, so “Popeye’ went ahead slowly towards Pulau Sebarok, where we encountered our firsts seabirds. These were Little Terns hunting in a group together with at least one Black-naped Tern. As it was still early, lighting was bad. As we slowly sailed on, we met a resident subadult White-bellied Sea Eagle out early on a hunt. This particular bird was interesting as its head was black. We suspect perhaps it’s residual oil trapped from its previous hunt, but we have no way of knowing for sure. 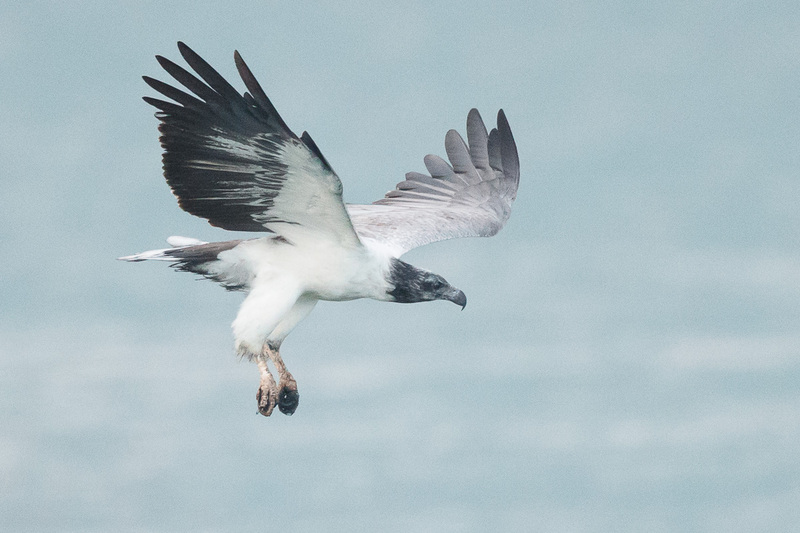 White-bellied Sea Eagle at Singapore Strait. This particular bird has blackened head feathers. Next we saw two adult Brahminy Kites perched on a yellow structure. 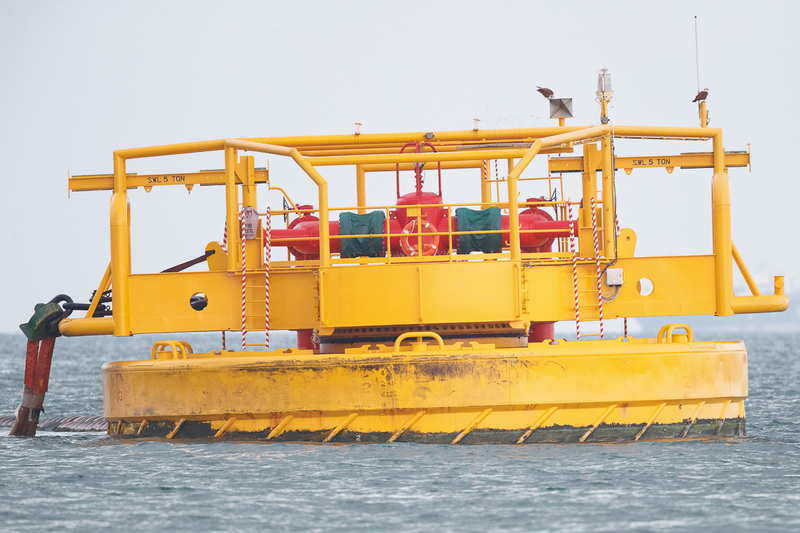 It’s interesting to see how our bird life use man-made structures to perch out in the sea. Brahminy Kite at Singapore Strait. These two are seen as tiny bird perching on the right hand side of the yellow structure. You can see that there are what look like giant “tubes” on the left hand side of the yellow structure. That was where we spotted the resident white-morph Pacific Reef Heron. That bought some joy to the bird photographers as it’s increasingly difficult to find this variant of the species in the mainland. Pacific Reef Heron at Singapore Strait. More Little Terns were seen at Pulau Semakau and leading to Raffles Lighthouse. By then, the lead boat caught up with the second boat and we started speeding up to head towards the open sea. The lead boat, “Boon Teik”. Photo courtesy of KC Ling. The first interesting (and almost impossible to find inland) is the Bridled Tern. 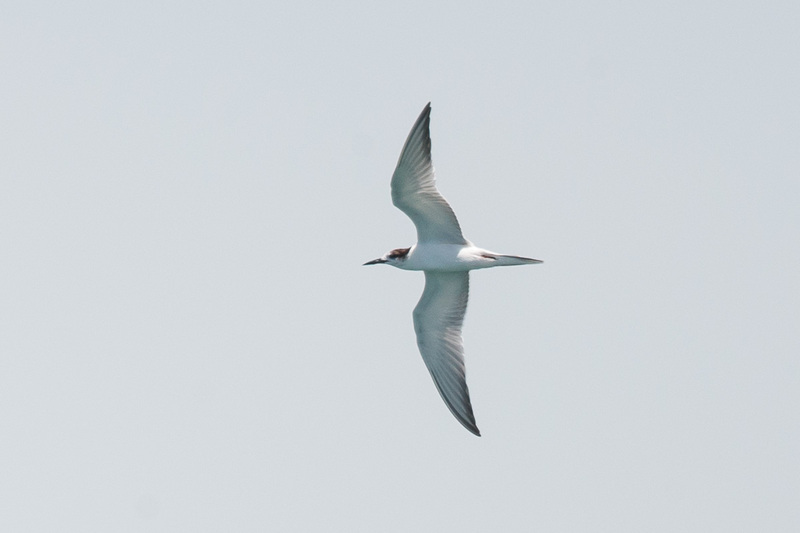 Bridled Tern at Singapore Strait. It was diving for food. In our excitement and due to the choppy sea condition, one of our participant got slightly hurt knocking against the railings. Two others at “Popeye” soon succumbed to sea-sickness. Things got progressively worse, as the choppy seas coupled with our trailing boat attempt to keep up with the leading boat made for a poor birding experience especially for the first-timers. We were somewhat cheered up when we saw our first of a few Aleutian Terns flying past around 9:30am. But they were quite far and challenging to photograph. It was only when we started our trip back and made our loop that the ride improved and it was then that we saw our first Aleutian Tern perched on wooden plank. We managed to get the boat nearer for closer shots, and as it flew off from the plank, some shot of it flying pass nicely as well. 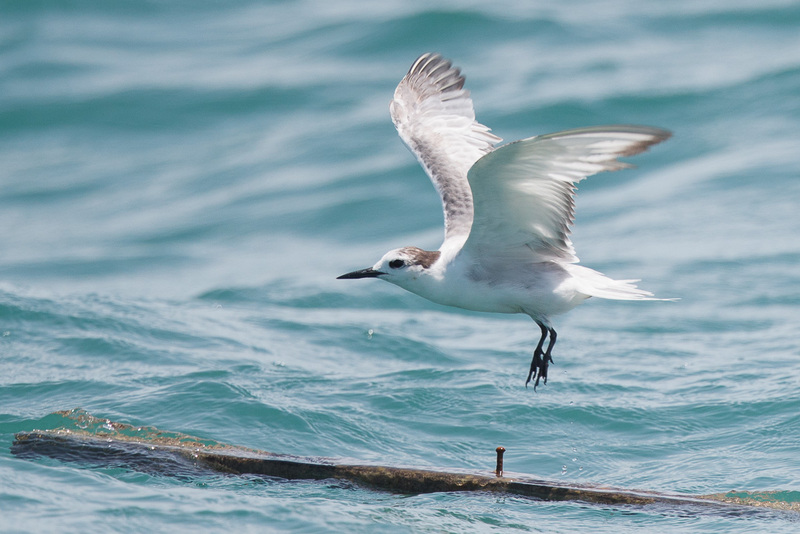 Aleutian Tern at Singapore Strait on a wooden plank, taking flight. Aleutian Tern at Singapore Strait. In flight and close by. The next tern to excite us was a Common Tern of the subspecies longipennis. It was a quick flyby, but good enough for a positive identification. Journeying back, we also kept our eyes on bird species other than the usual seabirds. 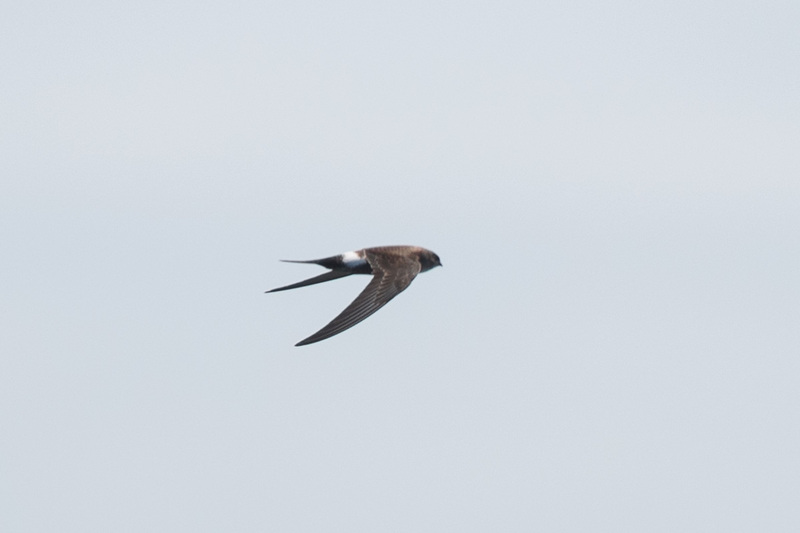 Not long after our Common Tern encounter, we noticed around 5 Pacific Swift flying low over the sea. These must be in the process of migrating over to Indonesia. We were to again see at least another 9 later at Sisters’ Islands. Pacific Swift at Singapore Strait. Flying very low just above sea level. The Swinhoe’s Storm Petrels did not make many appearances. In fact, for the trailing boat, we only saw two in the entire journey. The first was a very brief encounter, but the second permitted at least a closer look and photographs. Swinhoe’s Storm Petrel at Singapore Strait. Second bird photographed. After the storm petrel, we encountered the second and last perched Aleutian Tern. Again it cheered up our participants, who by now have generally recovered from their previous sea-sickness. Many photographs were taken of this rarely seen species. We in Singapore should be thankful on the ease of seeing this species in our waters. 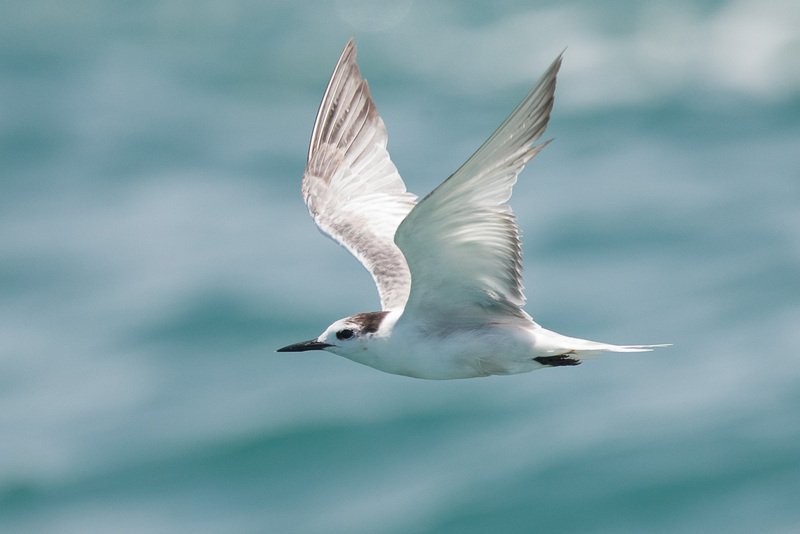 Despite its name, the Aleutian Tern is not easily seen at the Aleutian islands. 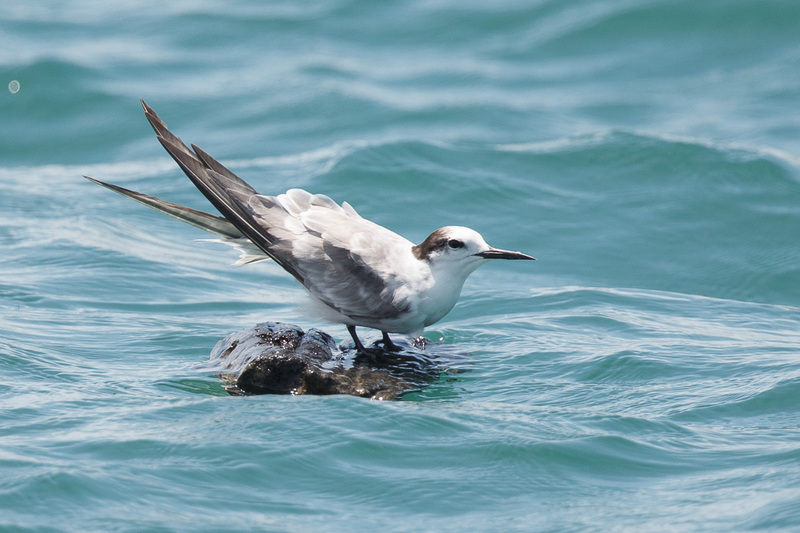 Aleutian Tern at Singapore Strait. Aleutian Tern and the participants of “Popeye” photographing the bird. Photo courtesy of Richard White. We were to encounter a few more Aleutian Terns along the way. In total we estimate we saw 10-15 of these terns. Quite good numbers. In fact, we think that the western side of the strait holds more of these terns. We were also surprised by the lack of crested terns (Greater and Lesser) that seem to be common birds on the eastern side of the strait. For the Bridled Terns, the trailing boat photographed only 2 birds. Again their numbers seem low in comparison to the eastern side. After our return and immigration clearance, we have enough time to head towards Pulau Jong for some photographs. 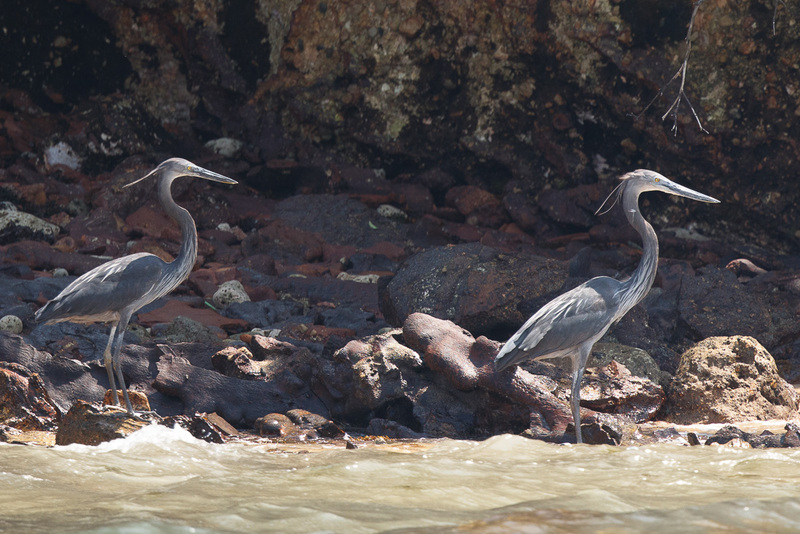 It turned out that we saw a pair of nationally threatened Great-billed Herons in breeding plumage. It gives us hope that their numbers will increase soon. A fitting end to our journey! Obligatory participants photograph at the end of the trip. Photo courtesy of Adrian Silas Tay. Published in 1959, the book “A Company of Birds” is a collection of bird photographs, ornithological notes and a semi-autobiography by Loke Wan Tho. These days, not many people recognise the name. Cathay Organization is perhaps better known in Singapore and Malaysia as a cinema chain, and in the past as a film studio as well. Loke Wan Tho was the founder of Cathay Organization and a business tycoon with other business interest in hotels, restaurants, tin mines and rubber plantation. He was also the Chairman of Malaysian Airways, Malayan Banking, Singapore’s National Library Board. With such a busy life, one can imagine there’ll not be much time for other pursuits. In the words of Malcolm MacDonald (then Commissioner-General for the United Kingdom in South-East Asia) in the preface for the book, “Mr Loke Wan Tho is one of the the finest bird photographers in the world, and perhaps the finest in Asia, so the appearance of a volume of his pictures of Asian birds is a welcome event“. Yet, the man himself humbly note “The photographs which appears in the following pages represent the product of the holiday and leisure hours of a businessman“. For this book, the photos, observations and accompanying notes are organized mainly by the locality in which they were photographed, namely India, Papua New Guinea and Malaya. His collection spanned many years between 1940s to 1950s and his trips outside of Malaya were organized to suit his busy work schedule. Most of the photos are in black and white and taken mainly with his quarter-plate film camera with flash. Contemporary bird photographers may at first dismiss the now antiquated and limited equipment used then, yet a cursory look at his bird photos will reveal a technical mastery and artistic expression that will rival the best photos taken today. Birders who are interested in bird behaviour will also be delighted by his keen observations of various species that he managed to photograph, especially so when describing the nesting behaviour of many inaccessible and now seldom observed species. It is interesting to note that one of his photo of the Black-naped Tern that is featured in this book was used as the basis for the drawing in Singapore’s old One Dollar banknote. According to Singapore Mint, there were 698.75 million pieces printed, probably making his photograph the most reproduced Singapore bird photo in existence. Although I highly recommend this book for anyone interested in birds and photography, the one catch is that it is now out of print. Thankfully there are many second hand book dealers that have copies of it for sale. I bought mine from AbeBooks a few years back. Lastly, the legacy for Loke Wan Tho in the field of Asian ornithology is not just confined to his own bird photographs, notes and observations published in this book. His enduring friendship and support for Salim Ali (the famous “Birdman of India”) surely influenced the outcome of Indian ornithology for the better as well. But that is a story for another time. Below are some scanned page to give you an idea about the book’s content.